Personalised Printing, Create Your One-To-One Marketing Campaign. With personalised printing, every single printing include flyers, brochure, invitation card, event ticket and any kind of promotional printing can include an individual's name or details like address, email, date of birth and so on. You can even create some personalised postcard which have different of picture like your whole family , each different people picture sending out postcard to different people. Best of all, there's no minimum quantity required. With Variable Data Printing you have the ability to use what you know about your recipients to send a message that is personalised and unique. Many businesses, corporate company and schools have increase Return On Investment and response rates using Variable Data Printing. Personalised Marketing To Increase Return On Investment. One-to-One marketing solutions can actually help you to produce more effective and profitable communications campaigns. It is proven that the direct marketingcampaign will greatly increase sales of a product, increase profits for a company and higher response rates from the customer.At Image Magic, our digital printing technology enable us to personalise any printed materials so you can be as creative and personalised as you like. Request a free quote today to find out how you can make your print talk. - Relevance and personalisation increase ROI. - Higher conversion rates with increased order quantity. - Maximize cost efficiency and get better postage rates by printing countless versions in a single print run. Take advantages of your customer information and fulfill your customers needs. 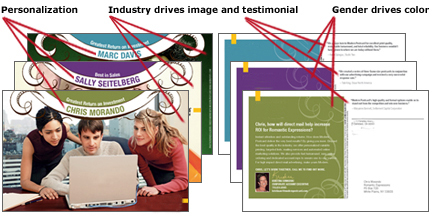 Specifically tailor your copy, images and colors to appeal to your customers. Would like to know more information on Variable Data Printing? Call 03 - 2072 6323 or our sales representative (Jeffrey Chan-6012 2949 818) to get started. We will propose a complete solutions for you to make personalised printing easy, affordable and effective! We will cover the process of preparing your database, acquiring a new list and setting up the design. It's easy, let get started!